This post provides a step-by-step example of deleting a class in Pega 7 with the Delete Class Wizard. This wizard can be used to remove a class and all the rules it contains from a Pega 7 instance. 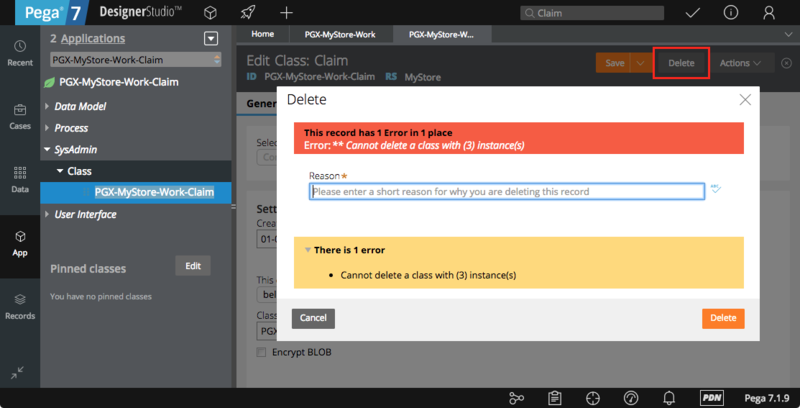 In this example, a Case Type Rule named PGX-MyStore-Work-Claim exists in the application. The screen shot below shows that case type rule and its containing rules in the Application Explorer. 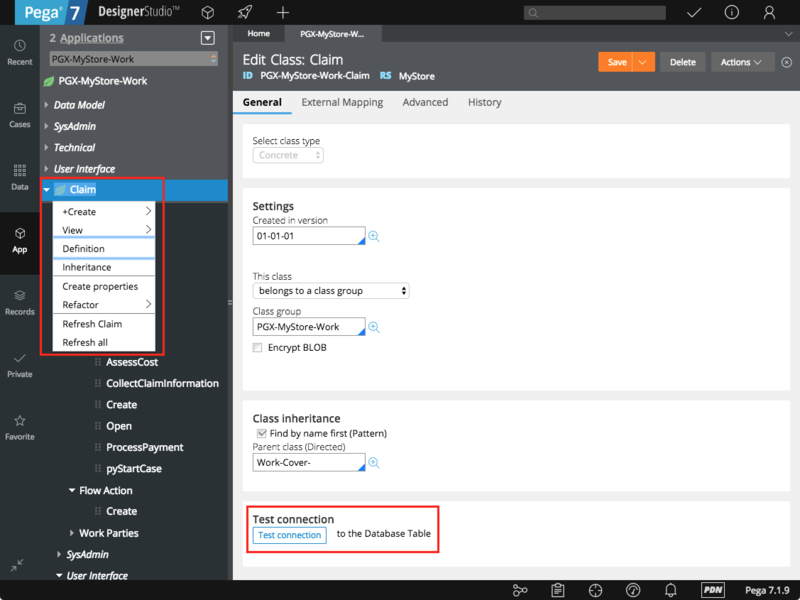 Note that the Claim class contains several rules such as Data Transforms, Properties, Flows and Sections. The Class of the Claim case type can be opened by right-clicking on its name in the Application Explorer and selecting Definition. Claim is configured using belongs to a class group, with the class group set to PGX-MyStore-Work. Therefore, instances of Claim are stored in the Pega DB table for PGX-MyStore-Work. Clicking on the Test Connection button opens a dialog that shows the mapping of the PGX-MyStore-Work-Claim class to a Pega DB table named pegadata.pc_PGX_MyStore_Work. A tool such as pgAdmin can be used to browse the pegadata.pc_PGX_MyStore_Work table. See this post for how to use pgAdmin to access Pega DB tables. The screen shot below shows that the table contains 4 rows. The first row represents the default work pool class, ending in -Work. The other 3 rows are instances of the Claim class that were created when running the application. A class can be deleted manually in the Designer Studio using the Delete button on the Edit Class form. This operation will result in an error if: a) the class contains instances or b) if the class contains any other rules. A class can only be deleted this way if all instances and containing rules have been removed first. This can be a tedious manual process. Therefore, Pega 7 provides the Delete Class Wizard. It will automatically delete all instances and containing rules when deleting a class. To open the wizard, use the Designer Studio main menu and navigate to System > Refactor > Classes. On the Class Refactor Utilities form, click on Delete a Class. Enter the name of the class that will be deleted, here the name is PGX-MyStore-Work-Claim and click on Next. A warning message will be shown and all classes to be deleted are listed. Review and click on Next to trigger the deletion of the class. If needed, this step of the wizard allows to search for and list all references to the class that was deleted. Select the option, here Search for references in all RuleSets, and click on Next. If the wizard found any references in the specified RuleSets, they will be listed on the next screen. In this example, no references to the deleted class exist. If references were found, the list of references could be exported to Excel or PDF using the buttons. Click on Finish to complete the process and the on Done to close the wizard. The class has now been deleted from the Pega instance and the Application Explorer and Designer Studio search controls can be used to confirm this. The Pega DB table pegadata.pc_PGX_MyStore_Work now contains only 1 row, which represents the default work pool class. The 3 instances of the Claim class have been removed.